I think this is going to be one of my favorite recipes of 2017. 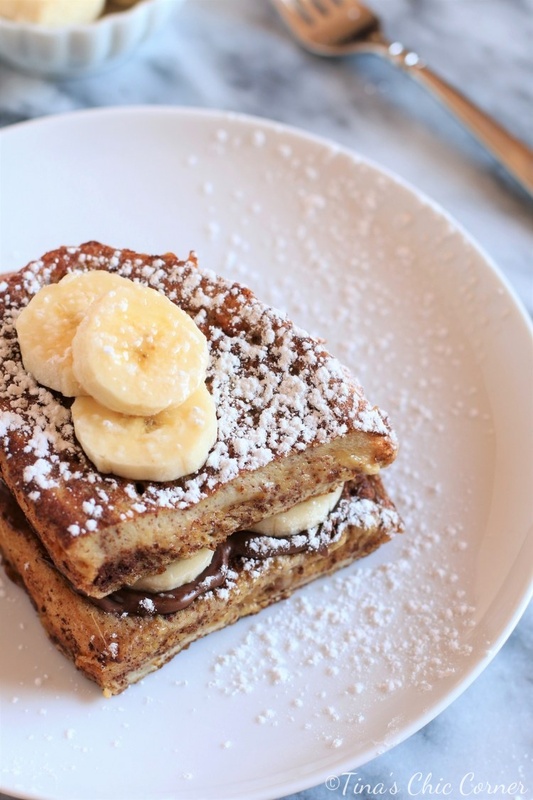 We’ve made French toast a number of times over the past month or so. And by “we” I mean my husband. He’s the chef when it comes to weekend breakfasts. He’s also the one responsible for making this Italian bread too. It’s the bread that we serve at almost every dinner party and he’s kind of famous for it now because he’s made it so often. The recipe makes a huge loaf so sometimes we have leftovers. Since we don’t want to waste any of it, we use it up the next morning as French toast. I’ve been racking my brain and trying to come up with a different way make French toast. (Occupational hazard for a food blogger.) The problem is that my husband’s classic French toast with butter and lots of powdered sugar is pretty much perfection. I know, big “problem” to have. It’s hard to come up with something that’s better or just as good. One day I got to thinking about our vacation in Quebec City last Fall when I had the most amazing crepes stuffed with chocolate hazelnut spread and fruit and topped with whipped cream. It was heaven. So I used that dish as inspiration for this one. I mean it’s almost impossible to go wrong adding chocolate hazelnut spread… to almost anything. My husband says the stuff can make shoes tasty. This should go without saying, but I’ll say it anyway, you can use whatever bread you want. Just keep in mind that your bread may turn out more or less custardy than what you see here, which subsequently means that you may get a different number of servings. In a large shallow bowl, whisk together the eggs, dairy, cinnamon, nutmeg, and vanilla extract. Dunk one bread slice in the mixture, flip the slice of bread over and dunk it again. Cook the coated bread in the skillet until done on both sides. Repeat until you are out of the batter, out of bread, or sick of French toast. 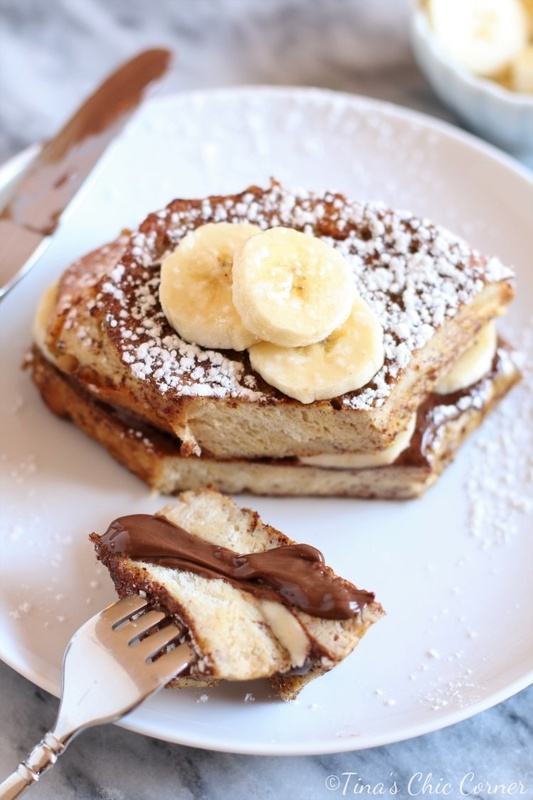 Spread as much chocolate hazelnut spread on top of one piece of French toast as you want. 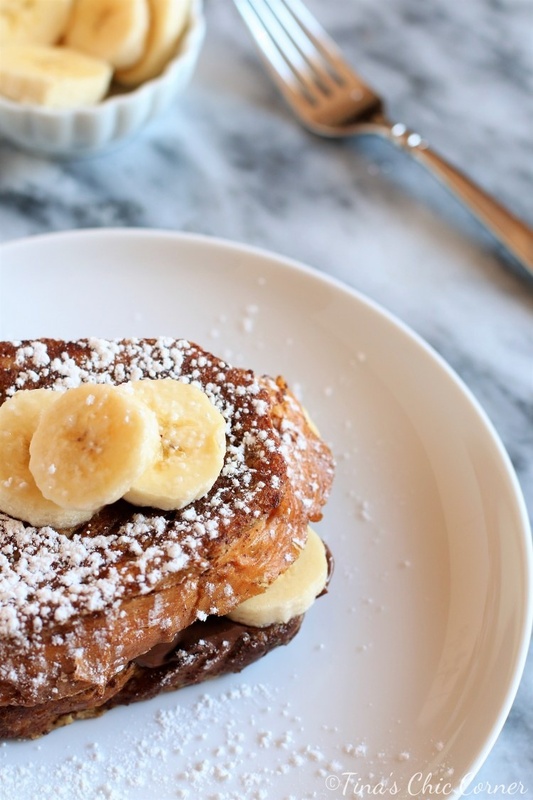 Lay as many sliced banana pieces as you want on top of the chocolate hazelnut spread. 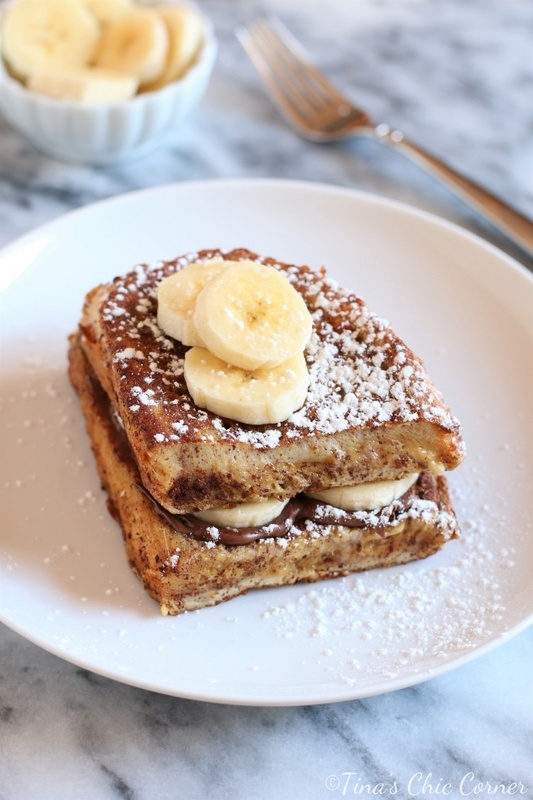 Top with a second piece of French toast. (Optional) Sprinkle powdered sugar on top of the sandwich. * Virtually any dairy will work. I’ve used everything from skim milk to whole milk and heavier dairy including half and half, whipping cream, and heavy cream. I’ve found the higher the fat content in the dairy, the better it comes out. I have not tried non-dairy milk such as soy or almond milk, but I suspect they would also work.